Filmmaking and virtual reality. How different and how similar? - Travelling within a film.Travelling within a film. Filmmaking and virtual reality. How different and how similar? Below are a few short reasonings in regards to my next project which is a 360 degree film tale. Film can use the instruments of VR to tell stories. But where does one start and the other end? Is this process leading to something that will relate to film the same way smartphones relate to landlines? We can start with the fact the both propose an immersive experience through the use VR glasses. If we leave special effects and interaction aside, what remains as unique characteristic is the feeling of being somewhere else. Even the complete darkness before a game or during a film is a digital “dark room”. So we have our common ground, namely immersive space. Another common element is interaction. It is there by default, because the sensor of the Oculus Rift is detecting the orientation of the head and respectively the body of the viewer. This makes it possible to look around and choose what to “exclude” from the entire picture. The spectator frames the story the way his/her will or instinct desire. This is a significantly different from traditional storytelling in cinema. We are transported to a different place, immersed in the fabric of the film. The director is still leading, but in a way that leaves us a full horizon for exploration. Space acquires distinct importance as a narrative element. I would say, we can safely conclude that there is interaction already when simply watching a movie with VR glasses. 1. It is extremely easy to loose the sense of being immersed in a film story, if some kind of controller is used. Because of the nature of present time VR glasses and sets, this interaction immediately brings us out of the film and transforms the experience into some sort of a video game. 2. When interaction means that the viewer is altering the storyline, the experience is different. One thing is if I am free to look around, another, if I can actually change the film destiny. Even if we only use eye tracking to make choices in the film, it makes us conscious of ourselves and subsequently may draw us away from the story. 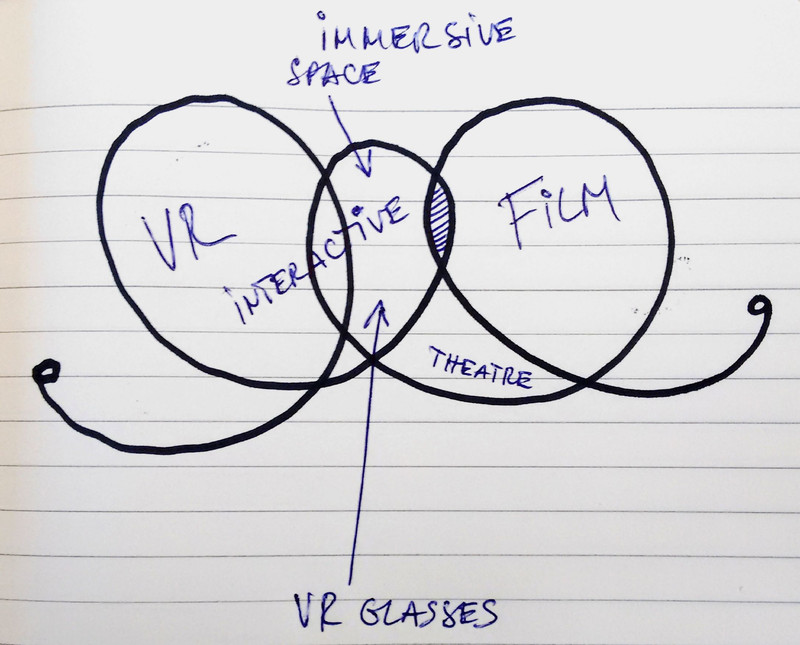 To summarise: Immersive feeling and basic interaction are the largest areas of overlapping between Film and VR. Anything that steps out of that border seems to form new categories and aggregates. This entry was posted in The wood of my canoe by Momchil Alexiev. Bookmark the permalink. I would like to ad some nuance to this statement, because I think it is a bit early to make it. If we leave every form of interaction out that will alow the viewer to alter the storyline, we will miss the upertunity to realy change the way we tell stories in the future. And maybe even let the lines between film and games slowly fade away. I think it is worth to explore other options than not to use interaction to alter the story at all, if we are concerned this will distract the viewer from the story. I think the more we can make the ways and tools we use to alter the story part of the story itself, the less we will feel drawn away from that story. Very good reasoning! It is early for any big statements in immersive cinema. It is rather time for practical discussion:) and that was my goal in writing this short entry, so I am happy you commented. You are absolutely right in saying we should not and cannot dismiss interaction in order to change the language of film. The transition from passive towards active interaction will change the entire discussion on spectatorship today. My goal with the short text from above was to think out loud and try starting “from the bottom” therefore asking myself: what is the least amount of interaction possible in immersive cinema?. Having answered that rather simple question the “active interaction” world beyond is a tabula rasa full of exciting questions! One thing intrigues me in the blurring line between games and films and I am curious what others think. Gamers say “my favourite game is like my favourite movie in which I am the main character”. If so, why try to make the two more alike? I propose to rather think of immersive cinema as a qualitatively different starting point. Lets focus on its unique qualities, and yes, define it with the help of close terminology but most importantly build its original one.